Hitched: Iain & Sara's Douglas Dawson Gallery Wedding - Part 1 — Sweetchic Events, Inc. When Sara & Iain came to me last fall to help plan their June wedding at the Douglas Dawson Gallery, I was thrilled to work with this lovely New York couple, and also excited to work at a new (to me) venue! 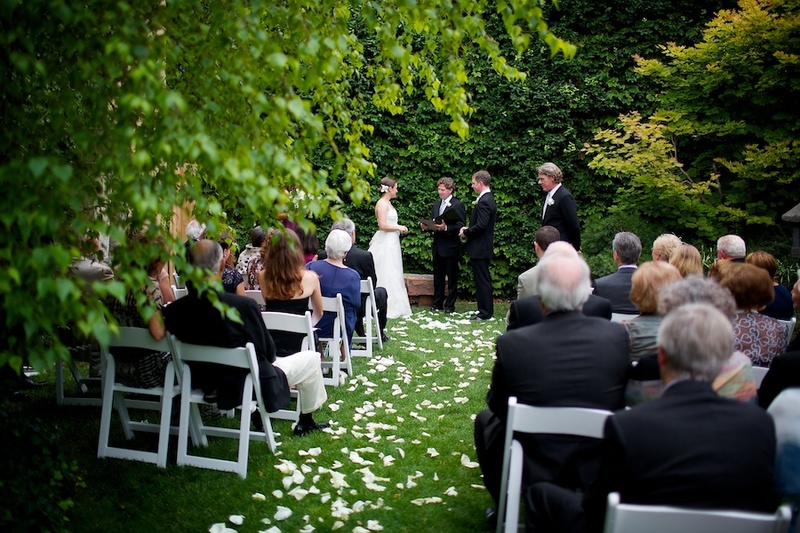 They wanted a warm, intimate, personal, garden-y affair in the city, and I think we achieved that look and feel. Photographer Steve Koo captured these beautiful images and I'm so excited to share them with you! Being a New Yorker, Sara purchased her gorgeous Jim Hjelm dress at Kleinfeld's (for you Say Yes to the Dress fans!). I said they wanted "intimate" and "gardeny"...and the small garden right outside the Douglas Dawson Gallery was absolutely perfect. They wanted to see each other for the first time at the ceremony, so Sara literally stepped out of the limo and down the aisle. I love love love the ivy-covered garden wall! This venue is truly a gem in Chicago's West Loop! Their friend officiated their wedding, and something he said must have been funny! In addition to being a New Yorker, Iain is British, so Food for Thought served "chips" in newspaper cones with a little British flag as a nod to his roots!! This absolutely stunning crescent shaped bouquet featuring lady slipper orchids, lisianthus, roses, stock, lily of the valley, and sweet pea was created by Vale of Enna, and probably one of my favorite bouquets of ALL TIME! Not many brides request lady slipper orchids (the green and white striped ones), but I absolutely love them! Stay tuned for their beautiful reception!